Pre-heat oven to 180°C. Cook potatoes in a large pot of boiling water for 20 mins, until just tender. Steam asparagus in steamer above potato's for 4 mins. Meanwhile place salmon on a lined baking tray and bake for 12-15mins. Drain potato's and cool slightly, cut into wedges. Place in a bowl with lettuce and asparagus. Combine mustard and lemon juice in a small bowl, gradually whisk in oil. Drizzle over salad. 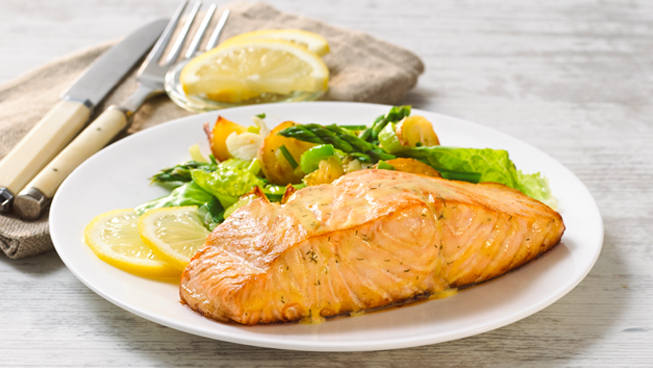 Serve potato salad with salmon and enjoy!